Child Labour: Desirable or Least Undesirable? Which of these instances would you interpret as Child Labour? 15-year old girl made to work as a prostitute. 15-year old girl working as a prostitute so that she can pay for school. 12-year old boy working 60 hours a week in a heavy machinery factory. 12-year old boy working 60 hours a week in his uncle’s heavy machinery factory learning the necessary skills so that he can run the factory after his uncle. 10-year old boy working at a farm, helping other adults pick up heavy logs. 10-year old boy working at a farm helping his father pick up heavy logs because they cannot afford adult labour. 7-year old girl helping her mother in cooking and cleaning at their home. 7-year old girl helping her mother in cooking and cleaning at someone else’s home. 4-year old boy running through the streets delivering orders for a bakery. 4-year old boy running through the streets delivering orders for his father’s bakery. This indecision is one of the reasons why international organisations have had little success in eradicating child labour or child slavery. The definition is fluid. The International Labour Organisation (ILO) has also helped in forming an international law to prevent child labour, which most countries have signed on, ratified and implemented in some form within their geographies. hazardous work done by children aged 15–17. Light work was defined, under this Convention, as any work that does not harm a child’s health and development, and that does not interfere with his or her attendance at school. and that is mentally, physically, socially or morally dangerous and harmful. In pre-industrial societies, children (sometimes as young as 13) actively participated in activities such as child rearing, hunting and farming alongside adults as soon as they are competent. This was important because children needed to provide their labour for their survival and that of their group. Recall that productivities and life expectancies were low during these periods and keeping children away from work at a young age would have done more harm to their welfare in the long run. Schools weren’t popular and most skills were passed down through direct mentoring or apprenticeships. 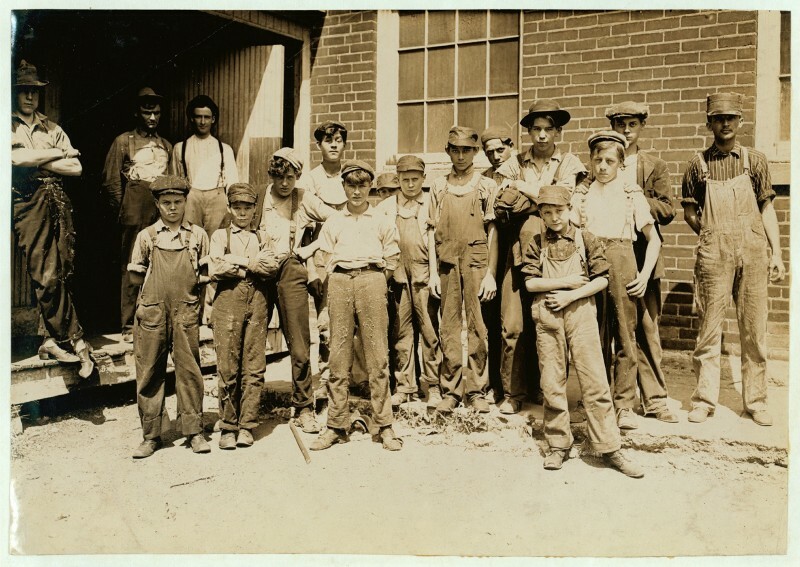 The Industrial Revolution employed child labour rapidly. Children as young as four were employed in production factories and mines working long hours in dangerous, often fatal, working conditions. In coal mines, children would crawl through tunnels too narrow and low for adults. 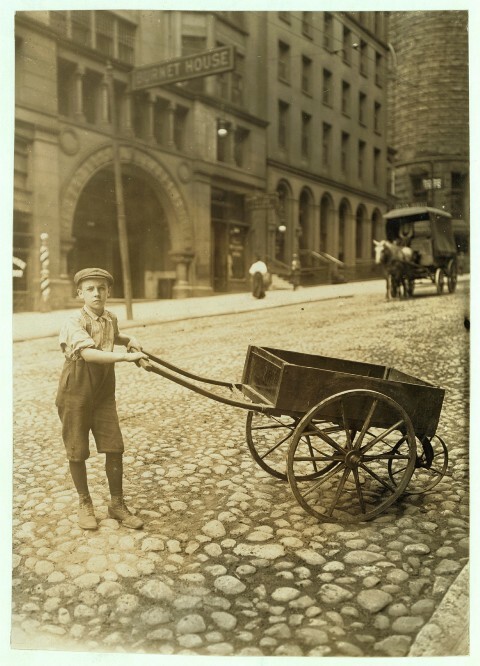 Children also worked as errand boys, crossing sweepers, shoe blacks, or selling matches, flowers and other cheap goods. Some children undertook work as apprentices to respectable trades, such as building or as domestic servants (there were over 120,000 domestic servants in London in the mid-18th century). Working hours were long: builders worked 64 hours a week in summer and 52 in winter, while domestic servants worked 80-hour weeks. In 19th-century Great Britain, one-third of poor families were without a breadwinner, as a result of death or abandonment, obliging many children to work from a young age. In England and Scotland in 1788, two-thirds of the workers in 143 water-powered cotton mills were described as children. A high number of children also worked as prostitutes. Child wages were often low; as little as 10–20% of an adult male’s wage. 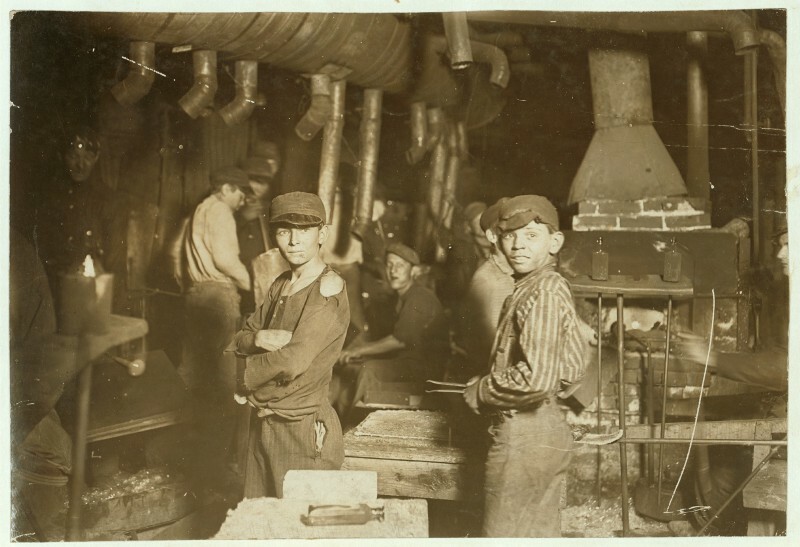 Throughout the second half of the 19th century, child labour began to decline in industrialised societies due to regulation and economic factors. Acts were passed but they were largely ineffective. As technology improved and proliferated, there was a greater need for educated employees. This saw an increase in schooling, with the eventual introduction of compulsory schooling. Improved technology and automation also made child labour redundant. Although formally banned since 1922, child labour was widespread in the Soviet Union, mostly in the form of mandatory, unpaid work by schoolchildren on Saturdays and holidays. The students were used as a cheap, unqualified workforce on kolkhoz (collective farms) as well as in industry and forestry. The practice was formally called “work education”. During World War 2 labour recruiting efforts targeted youths from Taiwan (Formosa), then a Japanese territory, with promises of educational opportunity. Between 250 to 304 million children aged 5–17 are involved in any economic activity. Some 60% was involved in agricultural activities such as farming, dairy, fisheries and forestry. 25% were in service activities such as retail, hawking goods, restaurants, load and transfer of goods, storage, picking and recycling trash, polishing shoes, domestic help, and other services. 15% laboured in assembly and manufacturing in informal economy, home-based enterprises, factories, mines, packaging salt, operating machinery, and such operations. Two out of three child workers work without remuneration alongside their parents in family work. Some children work as guides for tourists, sometimes combined with bringing in business for shops and restaurants. Child labour predominantly occurs in the rural areas (70%) and informal urban sector (26%). Armed conflicts, which affect 250 million children, are aggravating the situation of child labour. They use children as if they were disposable materials. Child labour accounts for 22% of the workforce in Asia, 32% in Africa, 17% in Latin America, 1% in the US, Canada, Europe and other wealthy nations. Asia, with its larger population, has the largest number of children employed as child labour at about 114 million. Latin America and Caribbean region have lower overall population density, but at 14 million child labourers has high incidence rates too. India with its larger population, has the highest number of labourers in the world under 14 years of age. Africa has the highest percentage of children aged 5–17 employed as child labour, and a total of over 65 million. In 2017, Mali, Benin, Chad and Guinea-Bissau witnessed over 50% of children aged 5–14 working. A 2006 study reported that over 800,000 children are working in Ecuador, where they are exposed to heavy metals and toxic chemicals and are subject to mental and physical stress and the insecurity caused by being at risk of work-related accidents. Minors performing agricultural work along with their parents help apply pesticides without wearing protective equipment. Poverty is (arguably) considered the greatest cause. Children work for the survival of themselves and/or the household by contributing about 25–40% of the household income. Lack of affordable schools and quality education drives children to labour because they have ‘nothing better to do’. Australia restricted child labour by compulsory schooling. Growth of the low-paying informal economy rather than the higher-paying formal economy, inflexible labour markets, inability of industries to scale up and lack of modern manufacturing technologies. Accessibility to factories that can produce the maximum amount of goods for the lowest possible price. Corruption in the government because laws that should be enforced to prevent child labour are not. Cultural beliefs such as ‘work is good for the character-building and skill development of children’ or that ‘children follow in their parents’ footsteps’, child labour is a means to learn and practice that trade from a very early age. Gender biases against the girl child also fall in this category. Not all work done by children is harmful, and not all work by them is beneficial. But there are arguments in favour of both. Here’s what people have to say for and against child work. Obvious first. It is wrong, encourages illiteracy, inhumane work and lower investment in human capital. Children may have to compromise with school attendance or performance. Children miss out on their childhood. Some poor children may have to work in order to procure resources for their school. And if the school does not provide apt or competitive learning, it might, in fact, impede the learning of more practical skills such as agriculture. In poor countries with very high incidence rates of child labour (e.g. Ethiopia, Chad, Niger and Nepal) schools are not available, and the few that exist offer poor quality education or are unaffordable. Young people are often found to enjoy their work when it involves the company of their peers. Experiments have shown that children find ways to combine work with play. Buenos Aires hosted the IV Global Conference on the Sustained Eradication of Child Labour on 14–16 November, 2017 with about 2000 delegates from 193 countries. They had hardly anything to celebrate. They become frustrated when their education is hindered, when they do not develop any skills, or their health is affected. Do you feel child labour is an undesirable or is it simply the least undesirable of a set of undesirable choices?